Are you a victim of Trial Period Plan scheme? Welcome to my blog, the place where I will detail how Bank of America Home Loans purchased their so called "Lender-Placed Insurance" on a house that already had home insurance, an illicit scheme to foreclose on a house. Why doing that? Because the mortgage lenders and the associates would receive an unauthorized benefit and additional commissions from the insurer if they assigned force-placed insurance policies to borrowers. Not only Bank of America Home Loans purchased the insurance when they were not suppose to, but they also offered me a Trial Period Plan, once I finished the Trial Period Plan, then the bank sent me a letter that "I was not eligible for the Trial Period Plan because "I had notified" Bank of America Home Loans that I did not wish to accept the offer", something that I'm pretty sure has happened to a lot of homeowners out there. From the time I signed the papers and received the house keys in 2008, Bank of America had always tried devious ways to get me into an escrow account. When I was in the process to purchase a house, while I was signing all the papers involved, the realtor had asked me if I wanted to have an escrow or not. I did not know what was an escrow at that time, but after the realtor gave me a quick answer, I decided to pay for my own taxes and my home insurance. At that time I had a good job and agreed to pay them out of pocket, so I would only had to make the monthly payments for the mortgage. 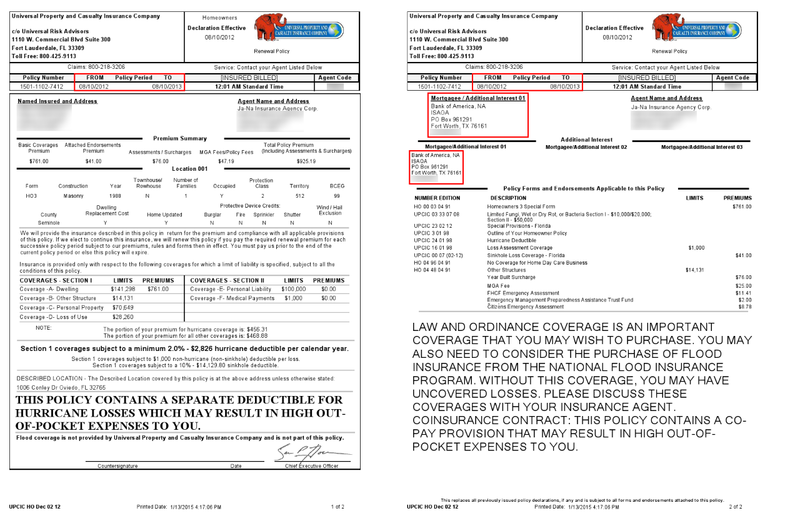 Sometime in the month of September 2011, after Jana Insurance had mailed proof of the home insurance, I received a letter dated October 26th, 2011 stating that the "Lender-Placed Insurance" was cancelled effective 08/10/2011 which is the date I paid out of pocket for the home insurance. 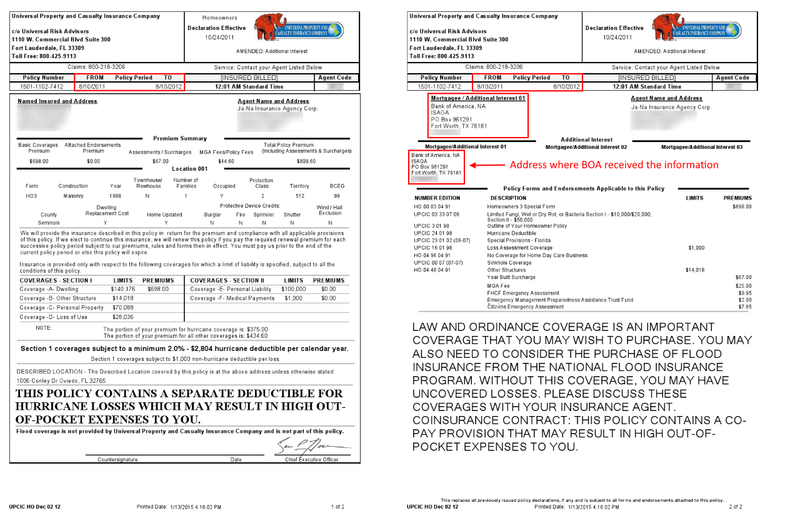 Take a look at the letter below and the address BOA shows to mail proof of insurance, the same address Jana Insurance mailed the home insurance to. In October 14th, 2011, November 16th, 2011 and December 15th, 2011 I went to the bank and made my regular mortgage payments, no issues at all. In January 9th, 2012 I went to the bank to make my regular mortgage payment, but the teller told me that the amount was not the correct amount. I asked the teller what she meant by "not the correct amount", and she mentioned that it was not $913.03, it was higher (teller did not tell me the new amount). I told the teller to process it, because that was my mortgage amount due, no more, no less and the teller did process it. When I arrived home from work after 5pm, I checked my mail and noticed a letter from BOA stating that "my loan was past due and my new amount due was $1,690.34. Where is that new amount due coming from, since the "Lender-Placed Insurance was cancelled? 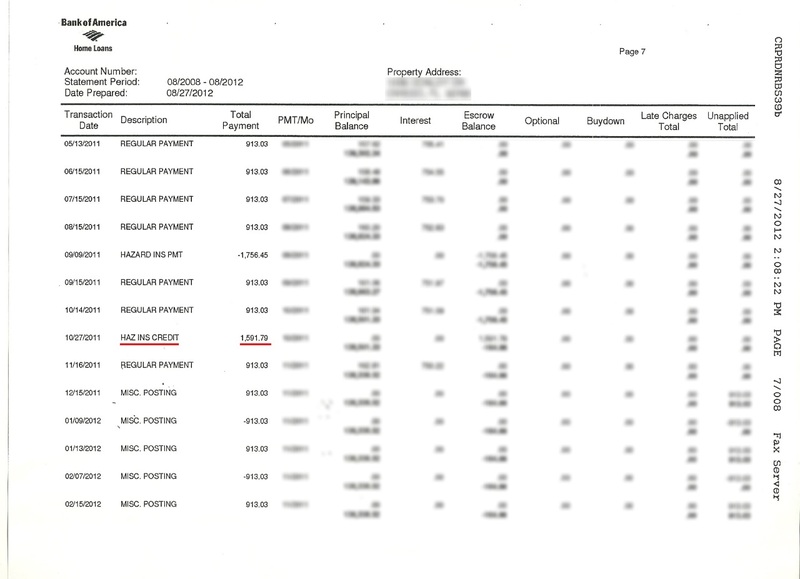 In February 7th, 2012 I went to the bank to make my regular mortgage payment, but the teller told me that the amount was not the correct amount (same issue I heard a month before). I told the teller to process it and she did. 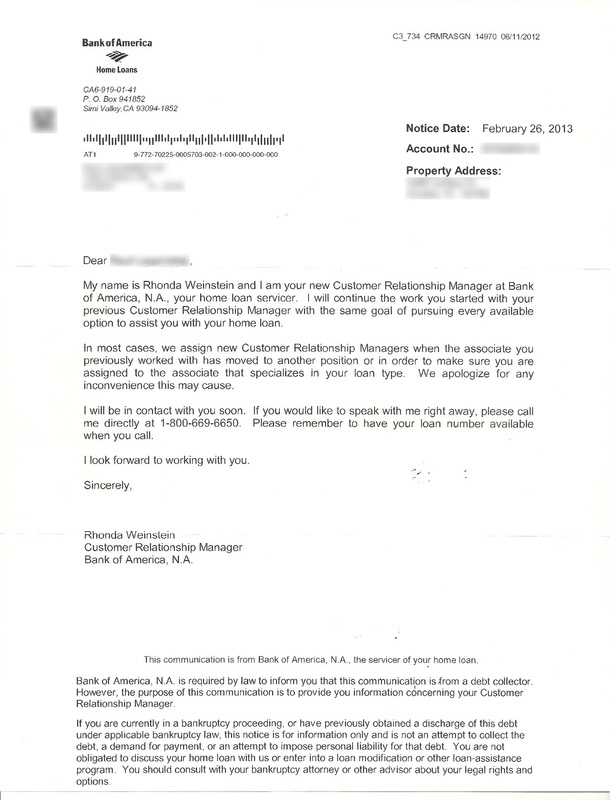 Below is the letter I received from BOA dated February 16th, 2012 with the new amout due. Since twice already I was told by the tellers at the bank that my payment amount was not correct, in February, 13th, 2012 I visited Suarez Law Group to explain about the "Lender-Placed Insurance and the issue that I was facing, because the bank was not accepting my mortgage payments of $913.03. During the conversation Mr. Suarez mentioned that he could start a modification process, but there was an issue, I have never been late on my mortgage payments since 2008, so in order to have the bank assist to approve a modification, I needed to stop making the mortgage payment for at least 3 months, so I made my last mortgage payment in March 15th, 2012 (remember, I have never been late on my mortgage payments since 2008, so I was not delinquent on the account at all). Contacted Suarez Law Group about it, and they resubmitted the documents requested by the bank for a second time. 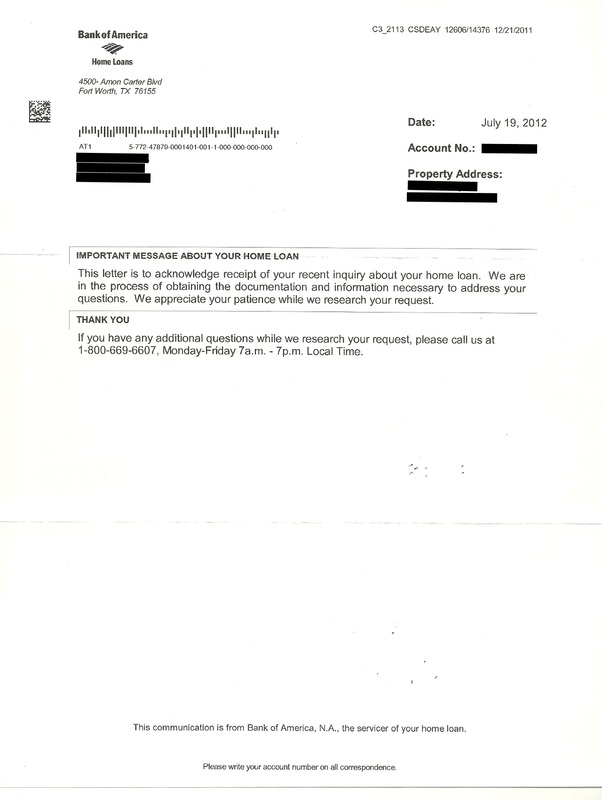 I received a letter July 31st, 2012 from BOA Home Loans dated July 19th, 2012 acknowledging receiving the documentation. 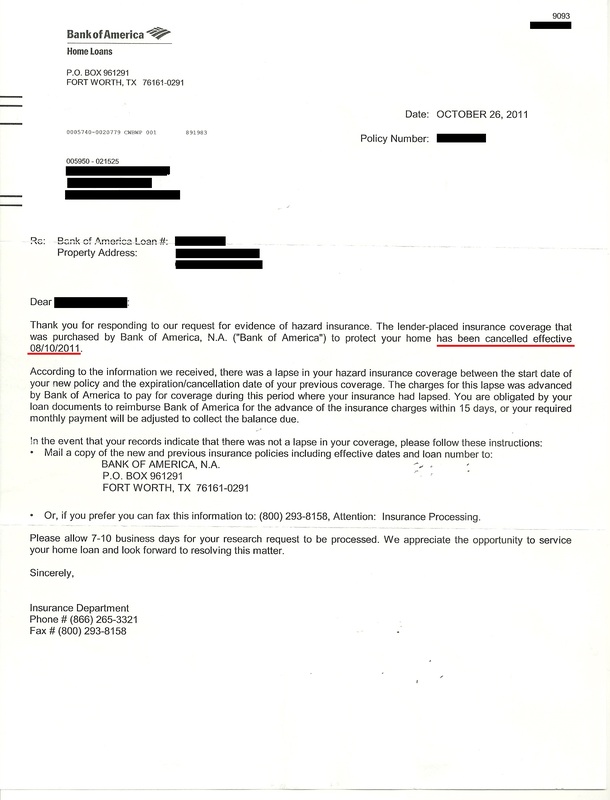 Once again Bank of America Home Loans came up with the excuse (2x already) that the mailed borrower's package was missing or incomplete. A couple of days later I received a letter from the bank letting me know they have added Suarez Law Group P.A. as an authorized party. 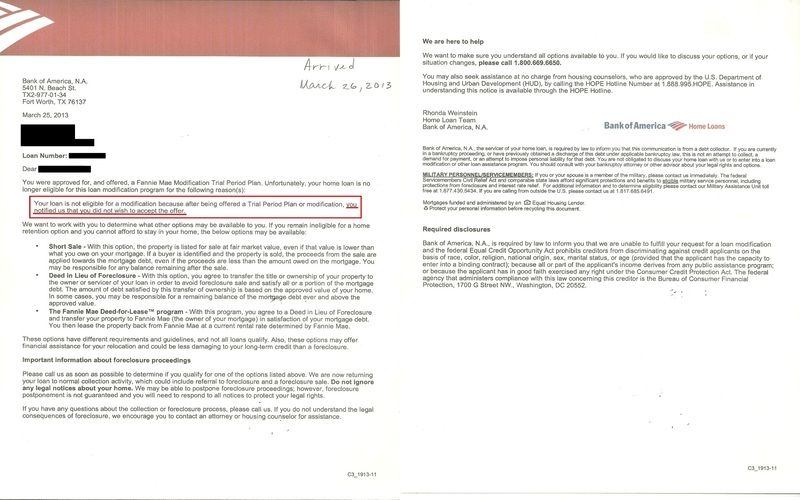 From May 2012, it took the bank 2 months and about 2 weeks to acknowledge that Suarez Law Group P.A. was my lawyer? July 24th, 2012 at 1:14pm, I received an email from Suarez Law Group. 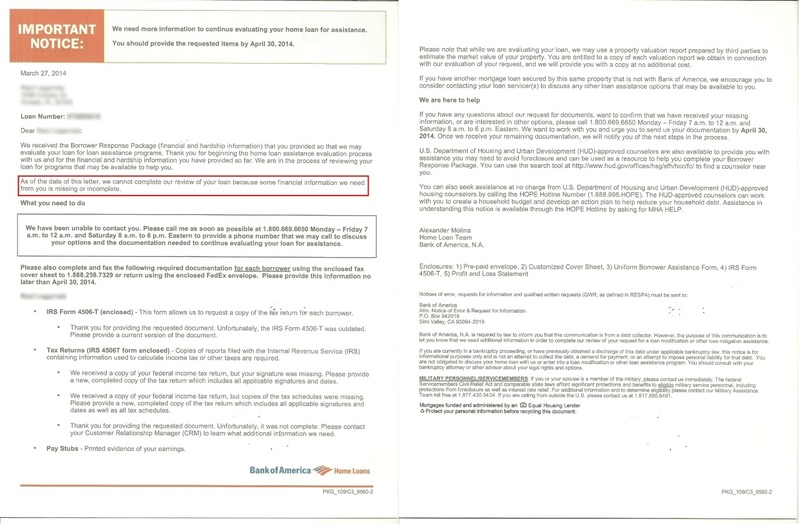 The email had a document attached dated July 24th, 2012 that BOA had transitioned to a Single Point of Contact (Nicole Legerski). 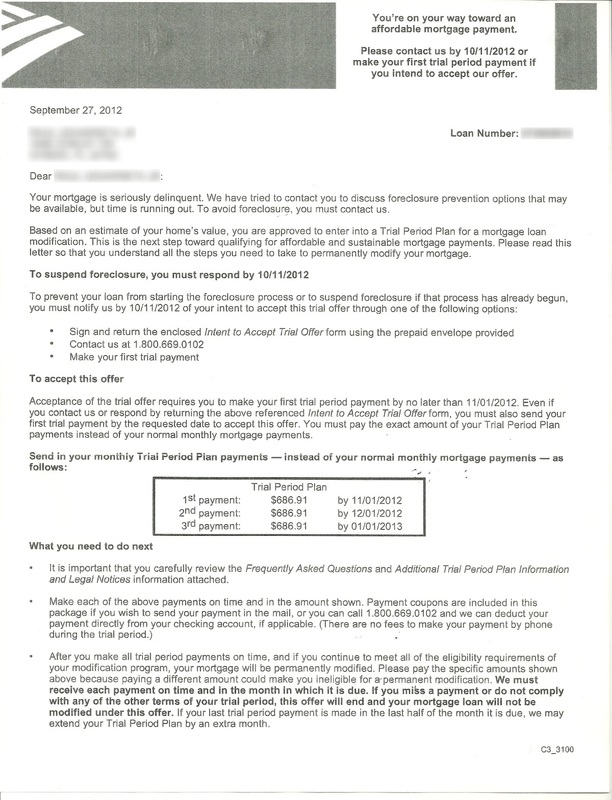 I do not know if Suarez Law Group mailed the borrower's package again for a third time to BOA Home Loans, but sometime in August 2012, I received a letter from BOA dated August 16th, 2012 stating "You are not eligible for a Home Affordable Modification because you did not provide us with the documents we requested." but because the bank did not get the full credit amout they paid, they added an escrow account. How is that possible when the bank sent me a letter stating that the "lender-placed insurance" was cancelled? A year has passed since 2011 that the bank purchased the insurance illegally, and not finished yet with all the stress with the previous insurance issue, BOA Home Loans purchased illegally AGAIN the "Lender-Placed Insurance" to cover from 2012-2013. 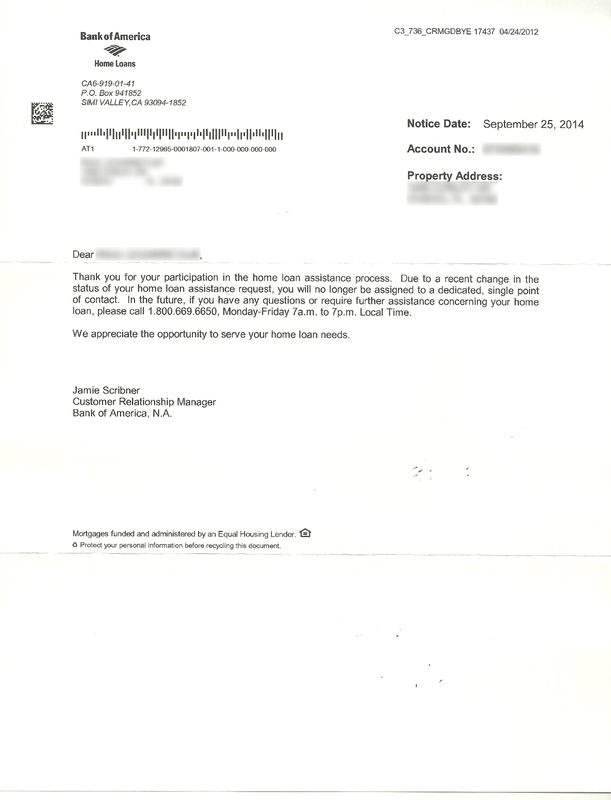 I already had coverage, BOA Home Loans DIDN'T NEED to purchase the home insurance. I found online the following information "Bank of America and Countrywide would force-place insurance policies so that they received an unauthorized benefit and received additional commissions from the insurer. This practice allegedly resulted in homeowners being forced to pay excessive rates for the insurance policies." 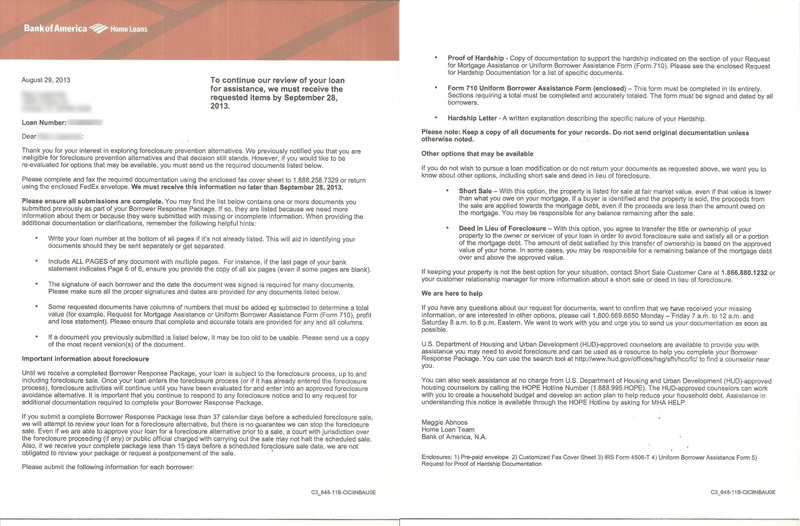 Sometime in October 2012, I received the Trial Period Plan offer letter dated September 27th, 2012 from Bank of America Home Loans, but the letter stated that my mortgage was "seriously delinquent" and to suspend foreclosure I needed to respond back to them by contacting BOA at 800-669-0102. I did call the number and spoke to Mary Lou Armenta and she explained the process for the Trial Period Plan and what I needed to do. The Trial Period Plan letter stated that the 1st, 2nd and 3rd payment were going to be $686.91 to cover for November 2012, December 2012 and January 2013. 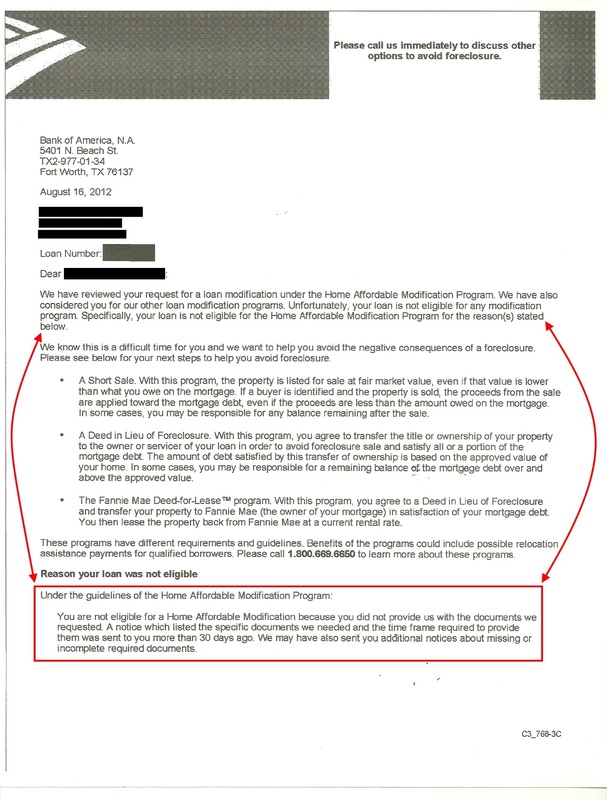 Towards the bottom of the Trial Period Plan letter it states: "After you make all trial period payments on time, and if you continue to meet all of the eligibility requirements of your modification program, your mortgage will be permanently modified." Mailed my 1st payment of $686.91 certified on October 26th, 2012 and it was delivered October 29th, 2012 at 6:34am. Mailed my 2nd payment of $686.91 certified on November 26th, 2012 and it was delivered November 29th, 2012 at 1:47am. Mailed my 3rd payment of $686.91 certified on December 21st, 2012 and it was delivered on December 25th, 2012 at 11:57pm. Mailed my 4th payment of $686.91 certified on January 25th, 2013 and it was delivered on January 28th, 2013 at 11:55pm. Mailed my 5th payment of $686.91 certified on February 26th, 2013 and it was delivered March 1st, 2013 at 11:10am. Mailed my 6th payment of $686.91 certified on April 25th, 2013 and it was delivered April 28th, 2013 at 4:05pm. Mailed my 7th payment of $686.91 certified on May 28th, 2013 and it was delivered May 31st, 2013 at 11:15am. Your loan is not eligible for a modification because after being offered a Trial Period Plan or modification, you notified us that you did not wish to accept the offer." 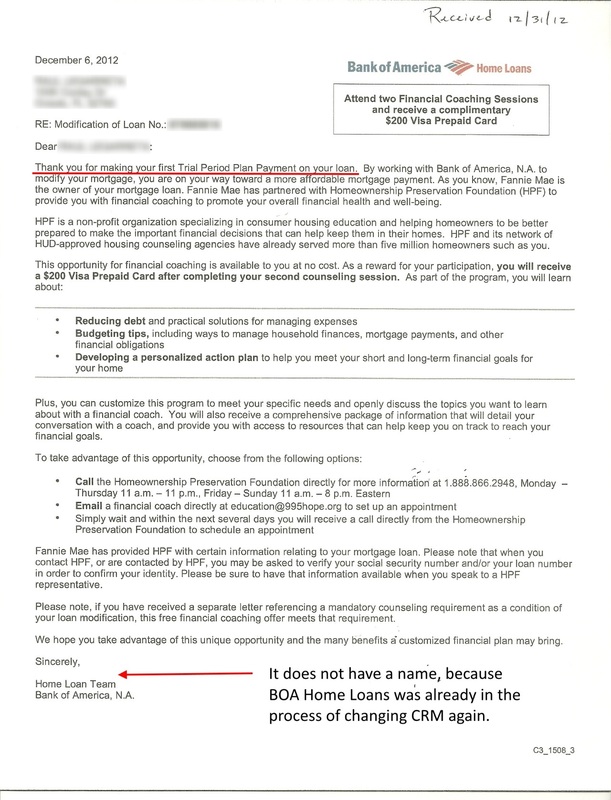 A homeowner spends money to hire a lawyer to start the modification process, and the homeowner called and notified BOA Home Loans that he/she does not accept the offer? What kind of crap is that? Obviously this is a well-planned SCHEME, a deliberate way of doing illicit business so BOA Home Loans associates can get unauthorized benefits and commissions. I called 800-669-0102, asked for Mary Lou Armenta and I was told that Mary Lou Armenta was no longer my CRM because she was moved to a different location/department, and my new CRM was Rhonda Weinstein. It is not the first time BOA Home Loans plays dirty, now this. During that time I went online and searched for Trial Period denied, Trial Period scheme, etc., and I found something called Dual Tracking. What is Dual Tracking? Dual tracking occurs when a mortgage servicer continues to foreclose on a homeowner's home while simultaneously considering the homeowner's application for a loan modification. In May 25th, 2013 at 8:35AM someone knocks on the door very hard numerous times. When I opened the door, noticed a man dressed casual, but had a police badge. Asked me if I was the owner of the house, then hands me a piece of paper and said "Your are being served." He placed like a check mark besides my name on his piece of paper, gives me the Civil Action Summons from Bank of America, and just leaves. I was in shock because I had no idea why I was being served, but I did not have much time to answer the summons, so on June 10th, 2013 I filed the MOTION FOR EXTENSION OF TIME, to buy me some time to search for a lawyer. 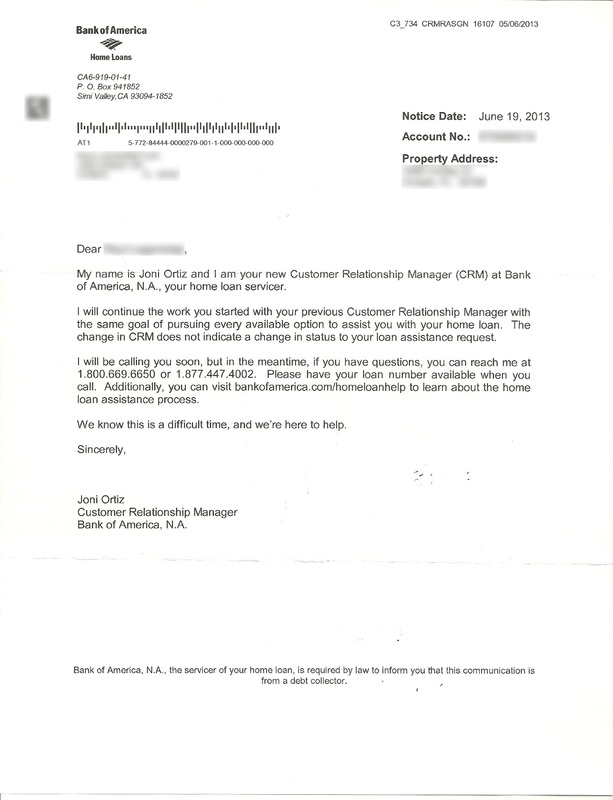 While I was searching for a lawyer, BOA Home Loans was in the process to change their CRM again, now Joni Ortiz. Filing the Motion for Extension of Time helped me searched online for a lawyer, which in this case I found the Law Offices of Grace Anne Glavin, PA and on July 10th, 2013 the attorney's fee agreement was signed. I remembered I filled out the borrower's response package at Mrs. Glavin office and I emailed the lawyer the paystubs, the hardship letter, bank statements, tax returns, etc. 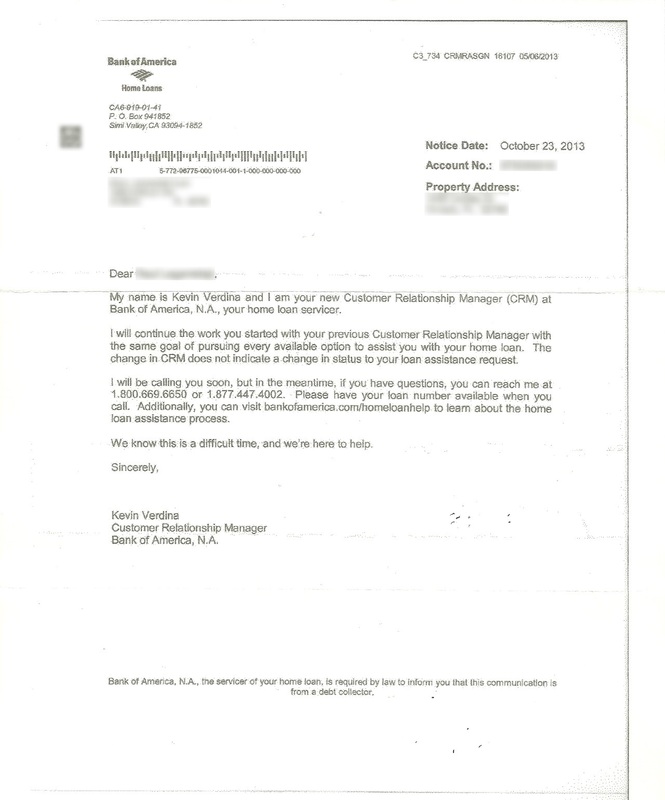 After submitting the borrower's documentation, I received a letter from BOA dated October 23rd, 2013 that my new CRM was Kevin Verdina. 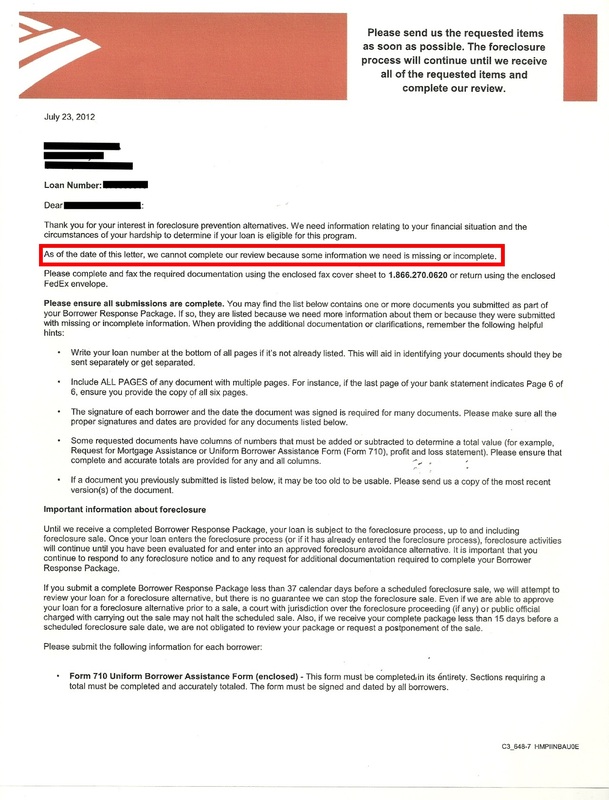 A week later August 30th, 2013 I received a package from BOA Home Loans with a new Customer Relationship Manager Maggie Abnoos and on the last page it stated: "We have reviewed your documentation and we are still missing required documentation that provides evidence of your hardship. We cannot continue our evaluation without this documentation." This is a completely different lawyer, and I'm receiving again the excuses from BOA Home Loans that the documentation is missing or incomplete. On the package was the 4506-T form and the Uniform Borrower Assistance Form 710 (4 pages) and the Request for Proof of Hardship Documentation. The lawyer submitted all the documentation requested by BOA again for a second time. 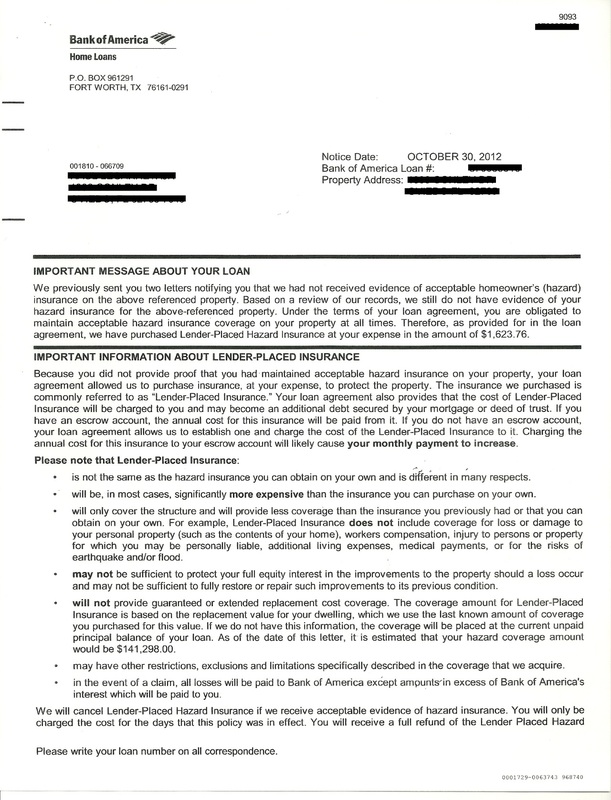 Sometime in the month of November 2013, I received a letter dated October 30th, 2013 from BOA Home Loans stating: "We have received the document(s) you submitted for your evaluation for a loan modification which was previously declined. 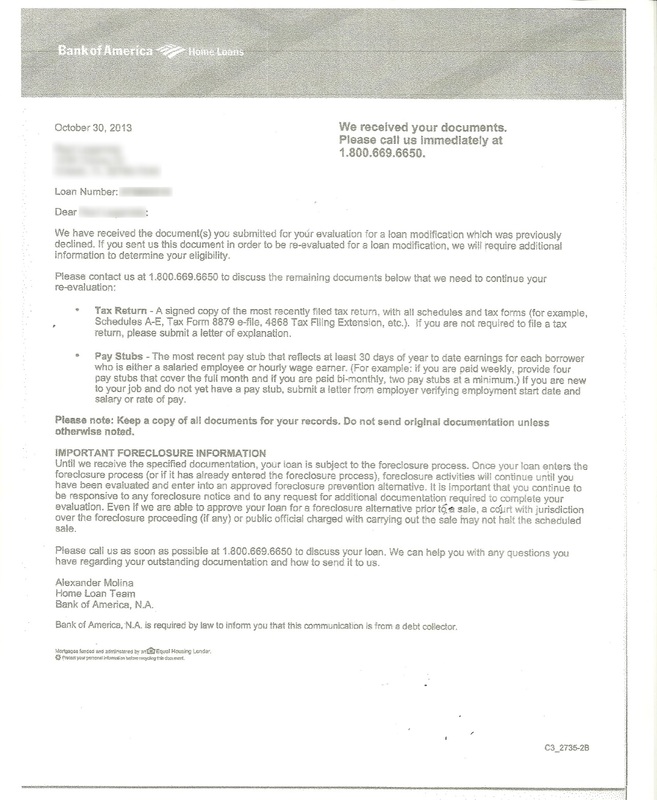 If you sent us this document in order to be re-evaluated for a loan modification, we will require additional information to determine your eligibility." You will see that the letter shows a different CRM named Alexander Molina. The lawyer Mrs. Glavin kept sending the borrower's package and everytime BOA Home Loans would say that the information was missing or incomplete. 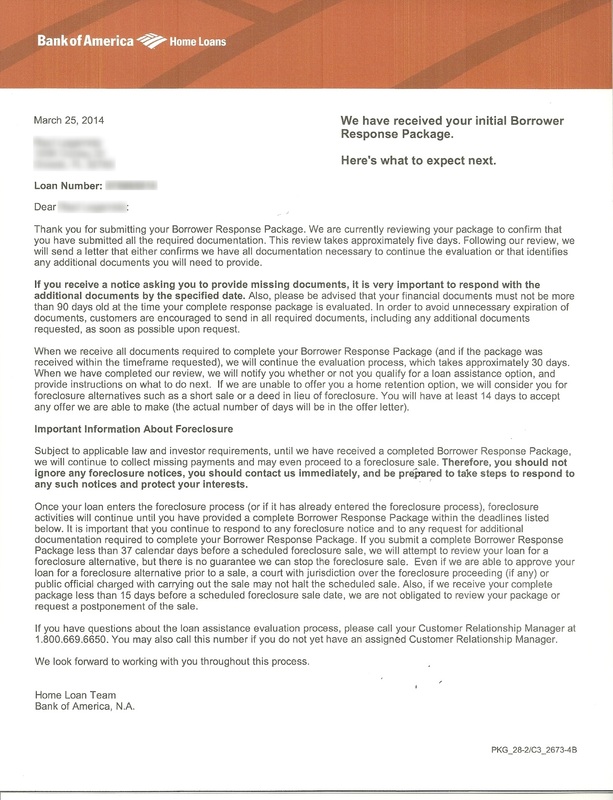 After Alexander Molina's letter I received a letter dated March 25th, 2014 stating: "Thank you for submitting your Borrower's Response Package. We are currently reviewing your package to confirm that you have submitted all the required documentation." What a bunch of stupid @ss%*#es. The borrower's package has been submitted numerous times. 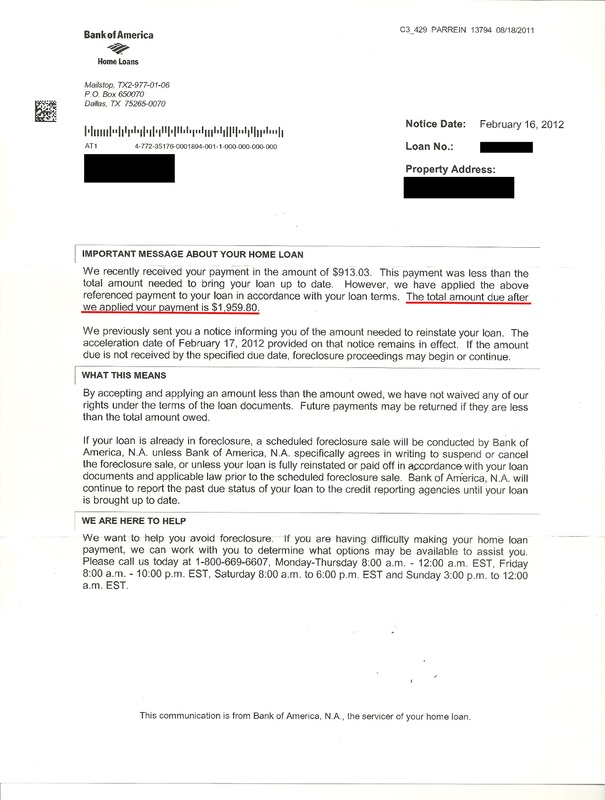 Three days later March 28th, 2014 I received a FedEx package with the same information as before: "We cannot complete our review of your loan because some financial information we need from you is missing or incomplete." The lawyer submitted the borrower's package again (I lost count how many times the borrower's package was submitted to BOA Home Loans). 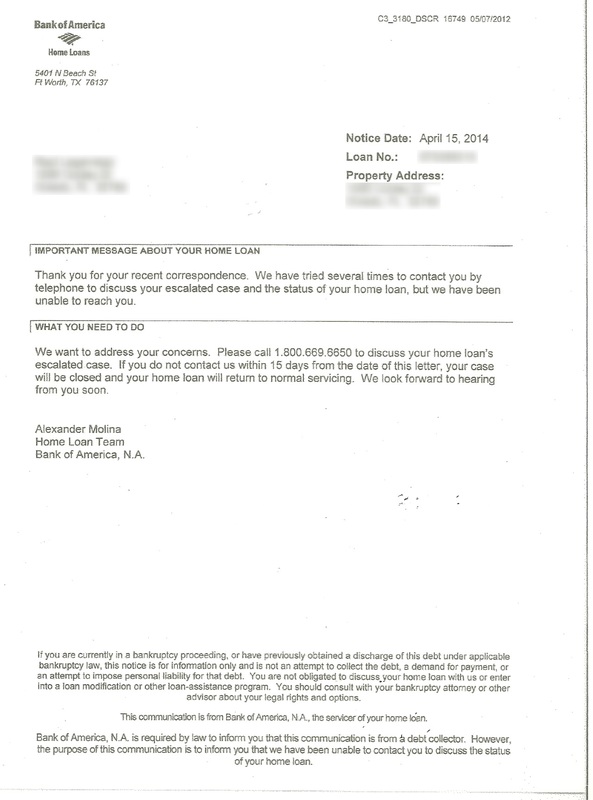 Almost a month later I received a letter that BOA Home Loans "Have tried several times to contact me by telephone to discuss my escalated case and the status of the home loan, but they have been unable to reach me" with Alexander Molina's name on the letter. There is a lawyer in place and the bank IS NOT SUPPOSE to be contacting me anyway, another illegal SCHEME to decline the modification. 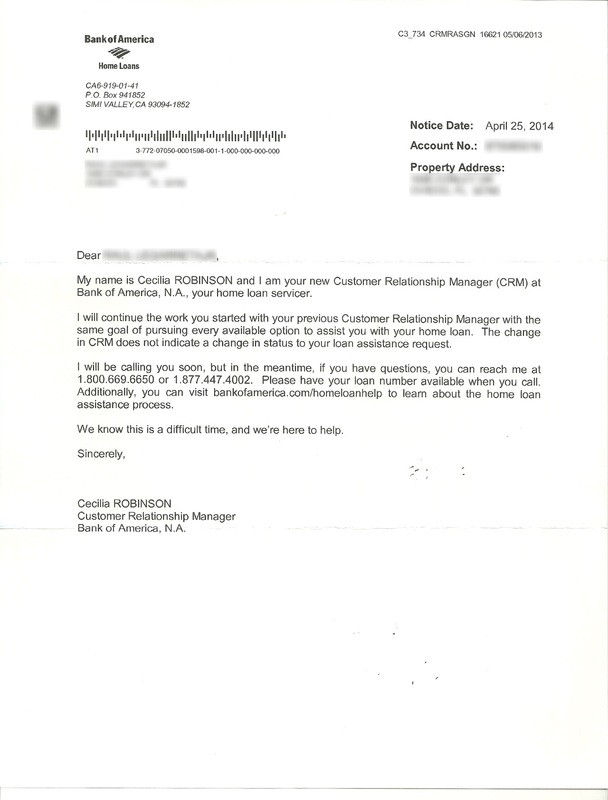 In April 30th, 2014 I received a letter from BOA stating that I had a new CRM and her name was Cecilia Robinson. The lawyer contacted BOA Home Loans and requested that all documentation be mailed to her directly, the phone calls were going to be made to her, and she would call me in a three-way call if needed. Right after the lawyer's request, in June 23rd, 2014 I received a letter stating that my new CRM (another one for the list) was going to be Giya Hunter. Since BOA Home Loans was contacting the lawyer directly, and the lawyer kept sending the borrower's package everytime BOA Home Loans would state that the "information was missing or incomplete", for a couple of months I did not hear anything until I received a letter in August 23rd, 2014 that my new CRM (another one for the list) was going to be Jamie Scribner. On August 25th, 2014 around 2:40pm I received a call from Jamie Scribner, then she told me that she was going to ask me some questions to verify some information. I told her, not a problem, but I was going to record the conversation, when she quickly mentioned "Oh we don't authorize that sir, if you are going to be recording, then I will have to disconnect." They can call you and record you, but they do not want to be recorded. Below you can listen to the couple of minutes of recorded conversation. 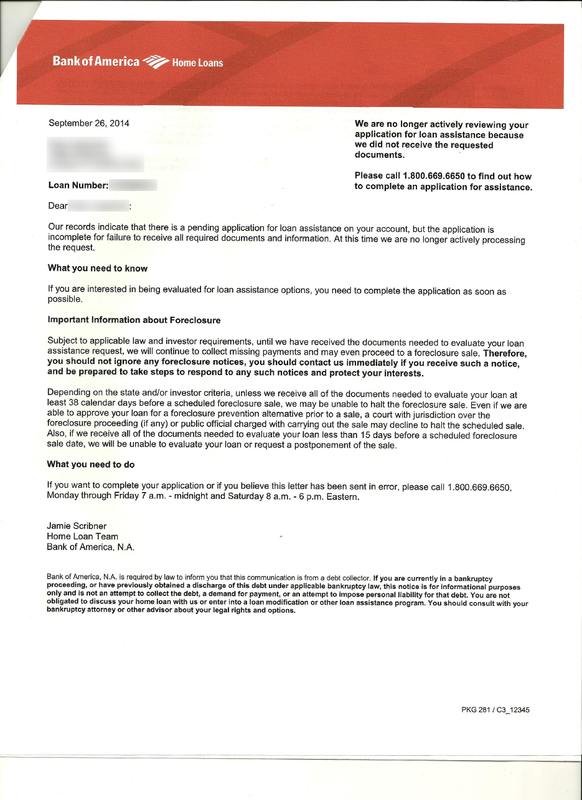 Real quick I received a letter on September 29th, 2014 with Jamie Scribner name on it that the borrower's package was incomplete "for failure to receive all required documents and information." Once again I have been denied the modification. 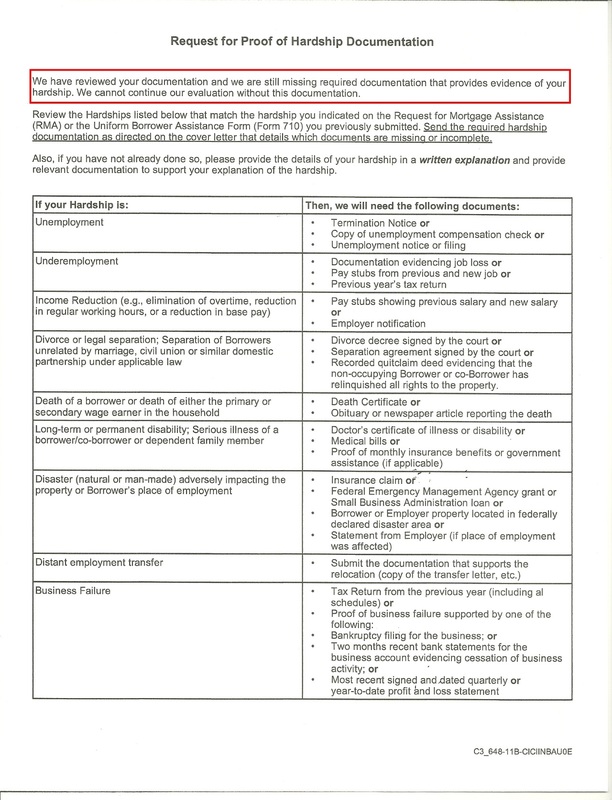 A month and a week later I received a letter dated September 25th, 2014 stating "Due to a recent change in the status of your home loan assistance request, you will no longer be assigned to a dedicated, single point of contact." Mrs. Glavin continued to work with BOA Home Loans directly and dealing with borrower's package since they were not contacting me anymore. Why? 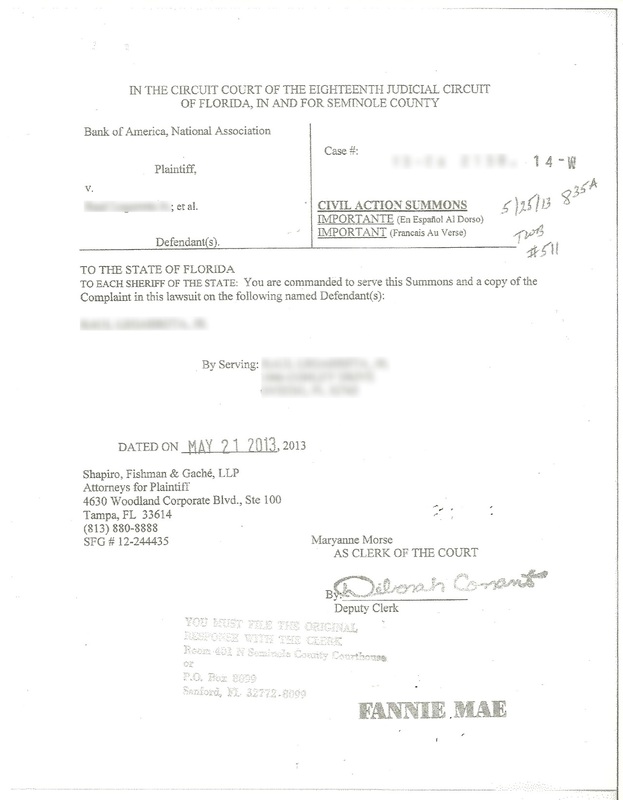 Because everytime they used to tell me "the documents are missing or incomplete", so I thought that by having the bank contacting the lawyer directly, they will cut the SH*T, but it is obvious they do whatever they want, because the court from the 18th Judicial Circuit are in favor of the bank's evildoing. 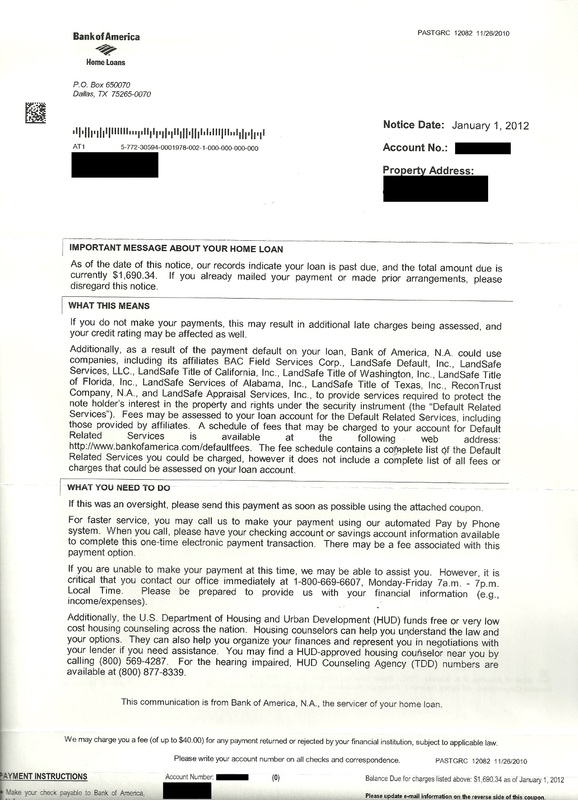 Mrs. Glavin continued to receive the "missing or incomplete" excuses from BOA Home Loans for months. 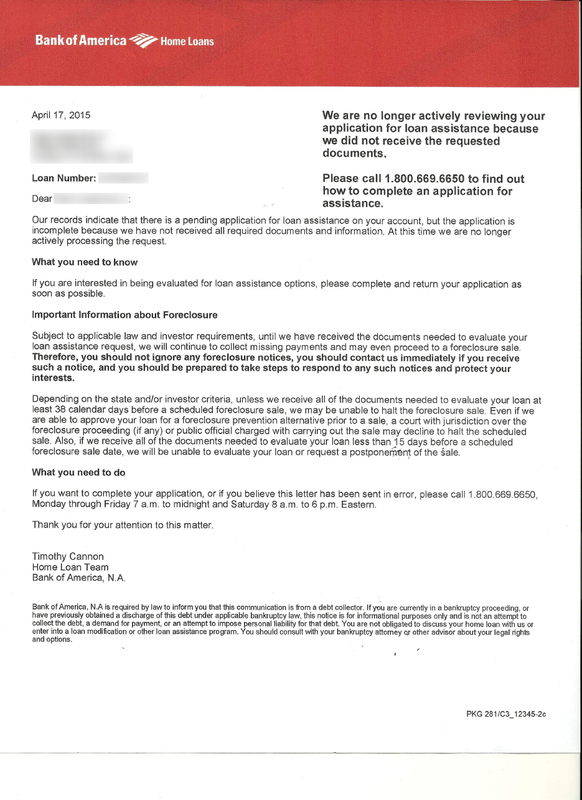 In the month of April 2015 I received a letter dated April 17, 2015 from BOA Home Loans stating "Our records indicate that there is a pending application for a loan assistance on your account, but the application is incomplete because we have not received all required documents and information. At this time we are no longer actively processing the request. ", and once again, the letter has a different CRM assigned to the case with the name Timothy Cannon. On top of all the issues that I have been having with BOA Home Loans and their evildoing business, now I have to spend money to contact a bankruptcy lawyer, because it is the only way to keep the house. After a couple of months searching for the difference between chapter 7 and chapter 13 and searching for a bankruptcy lawyer, I went to visit Matthew R. Gross J.D., P.A., at NeJame Law office. I brought with me the portable file organizer, showed and explained to Mr. Gross everything including the "Lender-Placed Insurance issue, the Trial Period Plan offered, the seven payments I made towards the Trial Period Plan, the letter I received that it stated that "I called BOA to notify them that I was not accepting the Trial Period Plan offer" and the new foreclosure summons. Again, with all the proof I have, Mr. Gross submitted all the documents, but someone at the court did not read or DID NOT CARE and went in favor of the bank. 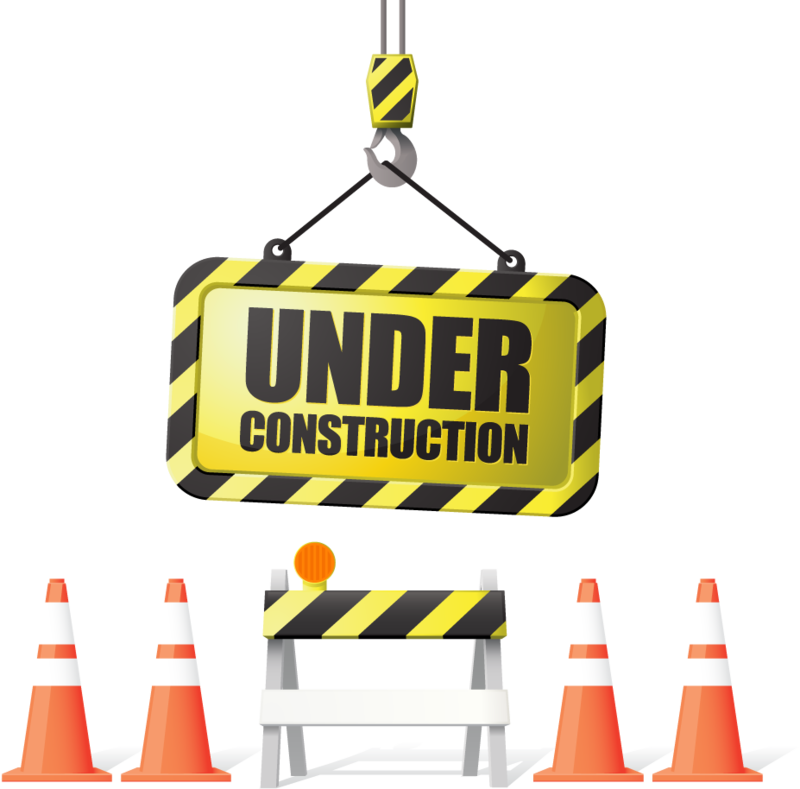 My modification is done, but it was not the modification I was looking for, because the bank reported the months I had not paid for the mortgage, on top of that they added court fees, lawyer fees and more. I would like to make this clear, all of this was caused because Bank of America purchased the "Lender-Placed Insurance" on top of the home insurance I had, an illegal strategy to foreclose on the home. 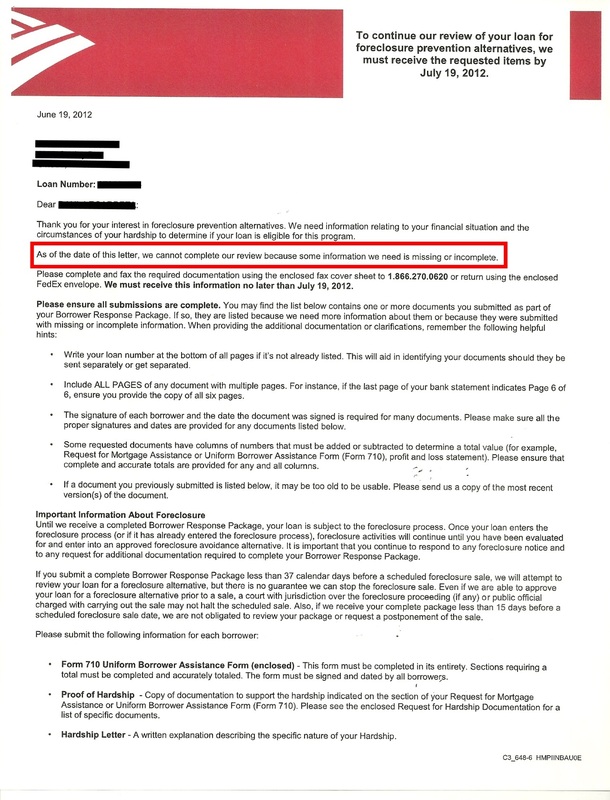 Remember that I mentioned that Bank of America associates would receive unauthorized benefits and additional commissions from the insurer if they assigned force-placed insurance policies to borrowers. So the associates would benefit from this illegal way of doing business, while the borrower/homeowner gets screwed up. Besides the fees mentioned before, the bank also added home inspections (what kind of home inspections are those?). I never saw a report where it showed who drove to report-in MONTHLY, what was reported, etc, again, illegal fees ($15 per inspection) that were added to the final modification numbers that I end up paying for it while the associates benefit from it. While the bank continued denying the modification from all angles, they kept adding fees. Those fees WOULD NOT BE THERE if the bank would have worked out the modifications months before. Do you get the point? Now, this is the part that pisses me the most. 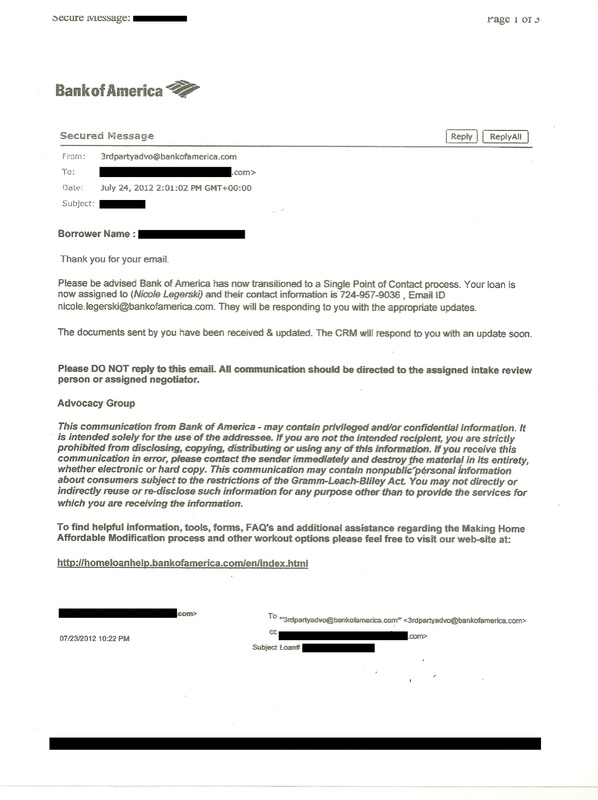 Bank of America had to upload documents to a portal because of the chapter 13 agreement as well as the documents from Mr. Gross had to be uploaded to a portal, meaning that all those documents were revised by the court, BUT WERE IGNORED. What I do not understand is WHY Bank of America added the "Lender-Placed Insurance" for 2011 and 2012 to the final numbers for the modification when Mr. Gross had show them I had insurance during 2011 and 2012 paid from my own pocket? Yeap, BOA Home Loans reported to the court the "Lender-Placed Insurance" for 2011 and 2012 (to the judge I HAD NO INSURANCE, which it is completely NOT TRUE.) Isn't that illegal? On May 4th, 2016 I contacted Bank of America at 800-669-6650 and spoke to Bruce at Customer Care who confirmed over the phone that Bank of America had purchased the "Lender-Placed Insurance" in 2011 and 2012. I asked to be transfer to speak to the new Customer Relationship Manager Maria Uribe, who also confirmed over the phone that the bank purchased the home insurance for 2011 and 2012. 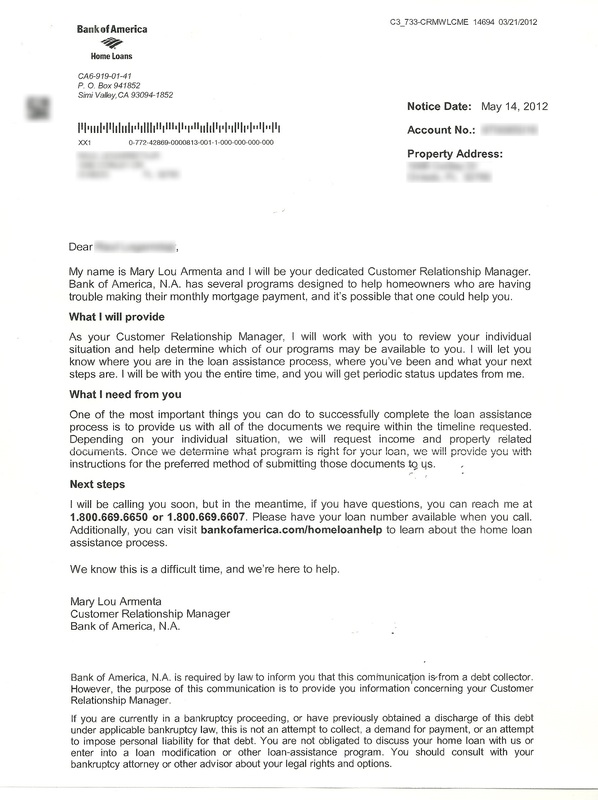 I asked Maria Uribe to send me a letter stating about the home insurance purchased in 2011 and 2012. Maria Uribe called customer service (Maria Uribe, customer service lady and I were on the phone at the same time) and requested that information to be mailed. 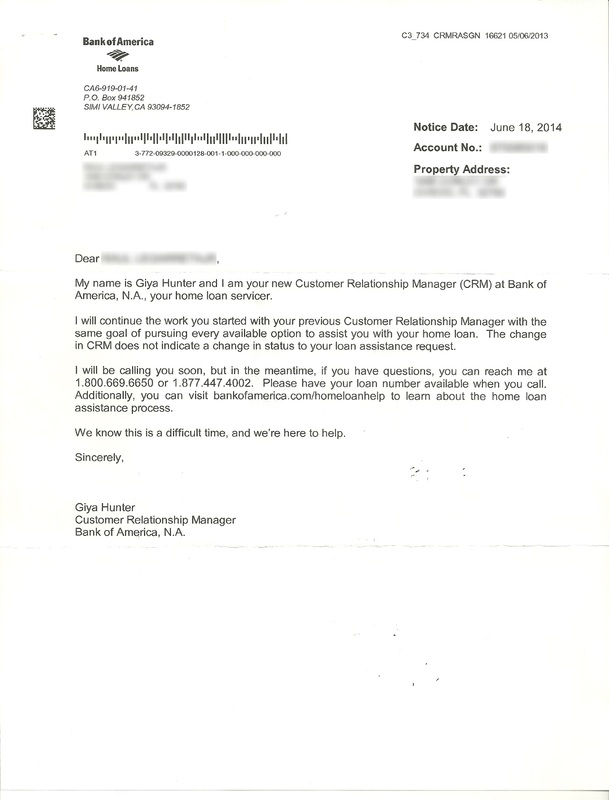 May 19th, 2016 I contacted BOA Home Loans because I have not received the letter I requested from them stating that they purchased the "Lender-Placed Insurance" in 2011 and 2012. I was told that "they could not speak to me because the lawyer has not sent an authorization for BOA to be able to speak with me" (FUC%#$NG @SSHOLES). Update: June 22nd, 2016 - I received an email from my attorney stating that an authorization letter was sent to Bank of America Home Loans. I'm giving them a couple of days and I will call back to request to speak to Maria Uribe. Lets see what kind of excuse she or they have now. Update: June 29, 2016 - I called Bank of America today 06/29/16 at 5:43pm and spoke to John (ID 4427) at the Case Manager's department. I asked John to transfer me to Maria Uribe because I wanted to talk to her. John quickly told me that Maria Uribe was on another line and that he was not able to speak to me because there was a modification code in the system. They have a coded modification in their system that John was not able to provide it to me. That code does not allow them to speak to me. John said that Bank of America cannot speak to me and that my lawyer needed to communicate through the DM Portal. I told John the portal was closed already, and John continue telling me that the lawyer needs to communicate with the bank through the portal, so I understood the portal still open. I called back again at 6:10pm because I wanted to see what the next rep would tell me. Glen (ID 6838) at the Loan Retention department told me that he was not able to speak to me, that I needed to contact my lawyer to authorize me. I told him that has been done already, and Glen told me there is no authorization in the system. Glen provided me with a fax number 800-658-9351 so the authorization can be faxed. Glen said it will take about 24hrs to show in the system. I really hope someone can read this and perhaps can advise me. IMO just because it is a bank, they have the right to step on homeowners, screw up homeowners, take advantage of home owners, provide fake assistance, and on top of all that, foreclose on a house while BOA states that the house had no insurance, but there is proof that the house had insurance and foreclose on a house while working with the modification process? The associates involved and the bank and the bank itself should be held accountable and bring charges against them for their evildoing, illicit business actions they have been doing.